Hello dear readers. May is Pediatric Stroke Awareness Month! 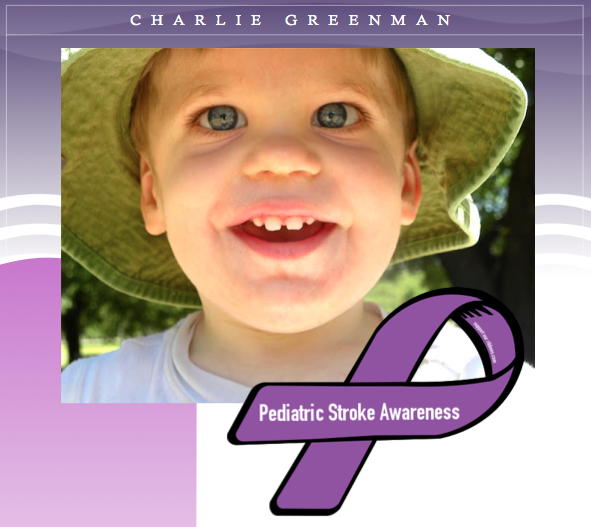 Many of you know that my son, Charlie (21 months old), is a stroke survivor. His stroke occurred before he was even born. When I first found out about Charlie's condition, I was devastated and totally confused. I did not know that children could have strokes. I thought they only happened in the older population. But its a lot more common than I imagined. 1 in 4000 children will have a stroke. Many parents don't even realize that their children have had a stroke and can they go undiagnosed for months. This is why I'm encouraging you to visit the CHASA (Children's Hemiplegia and Stroke Association) website for more information - especially if you have or know someone who has little ones. As for Charlie, he is making amazing strides this month. He is starting to sit unassisted for more than a minute at a time, is using the signs for "more" and "up" to communicate with his family and therapists, is giving high fives and is just starting to drink from a cup. These are all huge milestones for Charlie and we're all encouraged and thrilled by his progress. Please share Charlie's story with friends and family in honor of Pediatric Stroke Awareness month. To learn more about Charlie's journey or to help contribute to his medical fund, please visit Help Charlie Heal. Thanks as always for your amazing support and love for my little guy. Go Charlie Fighting Bear! I'm so glad to hear that your son is reaching these milestones. My cousin's son had a stroke at age four, and we were completely shocked. I had no idea the occurrence rate was so high. Charlie is lucky to have a wonderful, supportive Mum to help him reach his goals through life. It always makes me so happy to hear about Charlie's progress. He is one of the lucky ones, especially lucky to have such amazing parents! all the best of the BEST of HEALTH, LOVE, SUCCESS, MONEY to support you and - all FUN!! !